FQB "Lakeshore Cottage" Collection takes you to the waterside with its fresh and breezy colours and theme! Whether you're at the lake, oceanside, beach or waterpark this digital kit is sure to get your creative juices flowing! The background papers whisk you away to the cool water's edge with the waves paper and the tropical florals will delight you with their colourful blooms! 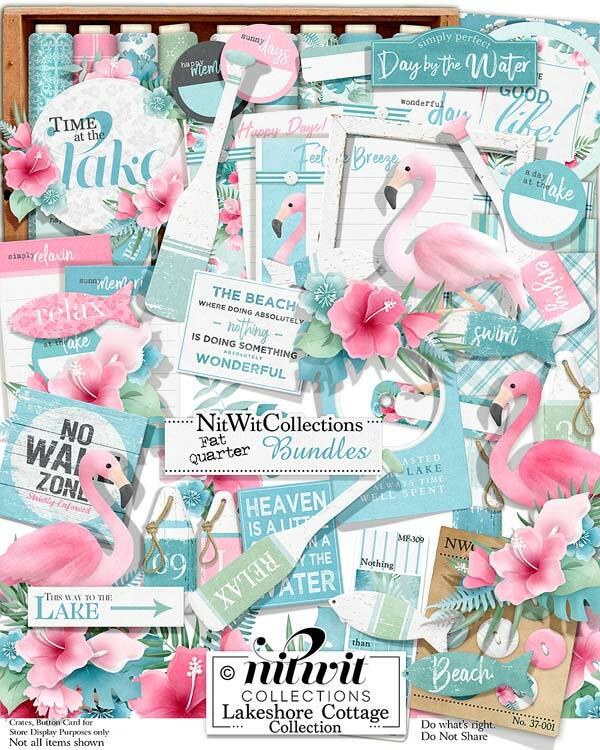 Add in a flamingo, a vintage worn buoy or one of the many labels and your digital scrapbooking layouts and cards will exude the summer fun! 1 Cluster with the oar, floral blossoms and tag for "A Day at the Lake"
1 Frame - "Time Wasted at the Lake...."
1 Lined journal mat - "Wonderful Day"
1 Lined journal mat - "Feel the Breeze"
1 Lined journal mat - "Happy Days"
1 Label - "Heaven is a Little Closer....."
1 Label - "Simply Perfect...."
1 Label - "The Beach, Where Doing Absolutely Nothing...."
1 Phrase label - "This Way to the Lake"
1 Sticker element - "Welcome to the Good Life"
1 Tag with a journaling area - "Perfect Day"
1 Tag with the water waves in the background - "Vacation"
1 Title element - "Time at the Lake"
1 Vintage worn sign - "No Wake Zone...."